Bologna attraction-guides.com - Bologna, Italy attractions guide Bologna Torre degli Asinelli (Tower of the Asinelli) and Torre degli Garisenda (Tower of the Garisenda) information about attractions, open hours, admission charges, location and address, general tourist information about Torre degli Asinelli and Garisenda in Bologna area, Italy (Italia) IT - Last updated 30/10/2012. The Torre degli Asinelli (Tower of the Asinelli) and Torre degli Garisenda (Tower of the Garisenda) are better known as Bologna's two leaning towers are one of the main attractions in Bologna, almost seeming to defy gravity. Rising high above the Piazza di Porta, the tallest of the two towers is the Torre degli Asinelli (Tower of the Asinelli), which stands at over 100 metres / 330 feet, containing 498 steps and leaning around 1.3 metres / 4 feet. Bologna's Torre degli Asinelli (Tower of the Asinelli) offers superb panoramic views at the top, across the city and surrounding countryside. 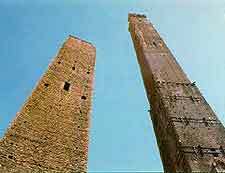 The other tower, Bologna's Torre degli Garisenda (Tower of the Garisenda), stands at 49 metres / 162 feet and is closed to the public due to its particularly extreme lean of over 3 metres / 10 feet and possible instability. Constructed during the 12th century, Bologna's leaning towers have poor foundations and were built as status symbols by wealthy Italian families in Bologna.